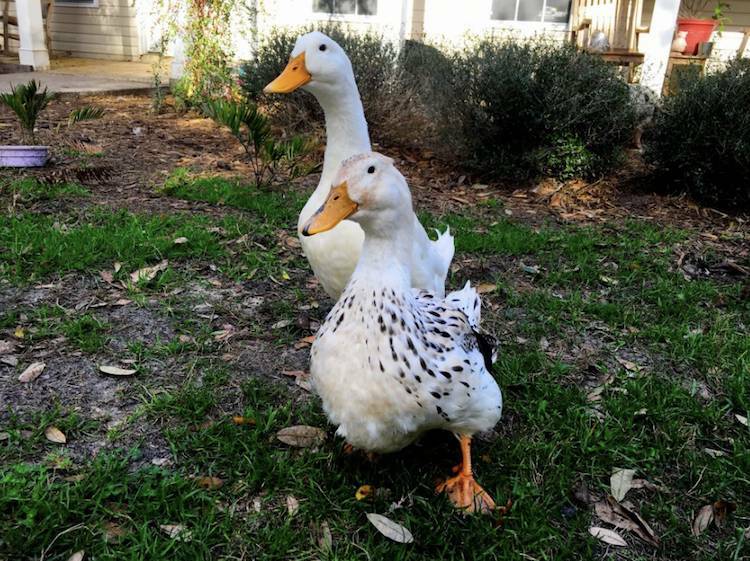 Daisy and Donald were released at a pond by their owners, but couldn’t handle the wild. Starving and injured, they were rescued. They love their new home at Rooterville! Daisy and Donald were Easter gifts, bought as little ducklings. But all too often animals bought as holiday presents end up being sent away or abandoned. Daisy and Donald were taken to a pond, where their previous owners probably thought they’d be able to live out their days. But Daisy and Donald didn’t know how to take care of themselves in the wild. All hungry Daisy knew was that people would feed her. So, she followed people around on the sidewalk near the pond, trying to get them to give her food. But she was starving, and so was Donald. Donald ended up getting snared by a fish hook in his bill, but this tragedy led to their eventual rescue! They were picked up by Fish and Wildlife, and nursed from starvation back to health at Rooterville. Daisy and Donald went from starvation to playing their days away in the green grass and on the pond at Rooterville.